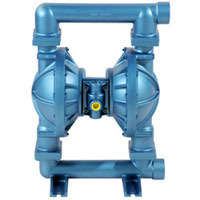 The Blagdon B50 Metallic Air Operated Double Diaphragm Pump range is available in Stainless Steel, Aluminium and Cast Iron with various component material options. Fitted with 2 inch suction/discharge fittings, the B50 Metallic operates at a maximum air pressure of 8.6 Bar and can achieve a flowrate of 500 litres per minute. Click here for Blagdon B50 Aluminum Data Sheet. Click here for Blagdon B50 Stainless Steel Data Sheet.